Every one of India’s 1.3 billion people uses an average 11kg of plastic each year. After being used, much of this plastic finds its way to the Arabian Sea and Indian Ocean, where it can maim and kill fish, birds and other marine wildlife. Fisherman in India’s southern state of Kerala are taking on the battle to cut the level of plastic waste in the oceans. When the trawlers drag their nets through the water, they end up scooping out huge amounts of plastic along with the fish. Until recently the fishermen would simply throw the plastic junk back into the water. But last summer Kerala’s fisheries minister J. Mercykutty Amma started a scheme to change this. Under her direction, the state government launched a campaign called Suchitwa Sagaram, or Clean Sea, which trains fishermen to collect the plastic and bring it back to shore. In Suchitwa Sagaram’s first 10 months, fisherman have removed 25 tonnes of plastic from the Arabian Sean, including 10 tonnes of plastic bags and bottles, according to a UN report on the scheme. Once all the plastic waste caught by the Keralan fishermen reaches the shore, it is collected by people from the local fishing community – all but two of whom are women – and fed into a plastic shredding machine. Like so many of India’s plastic recycling schemes, this shredded plastic is converted into material that is used for road surfacing. There are more than 34,000km of plastic roads in India, mostly in rural areas. More than half of the roads in the southern state of Tamil Nadu are plastic. This road surface is increasingly popular as it makes the roads more resilient to India’s searing heat. The melting point for plastic roads is around 66°C, compared to 50°C for conventional roads. Using recycled plastic is a cheaper alternative to conventional plastic additives for road surfaces. Every kilometre of plastic road uses the equivalent of a million plastic bags, saving around one tonne of asphalt. Each kilometre costs roughly 8% less than a conventional road. And plastic roads help create work. As well as the Keralan fishing crews, teams of on-land plastic pickers across India collect the plastic waste. They sell their plastic to the many small plastic shredding businesses that have popped up across the country. The need for schemes such as Suchitwa Sagaram is emphasised by research that shows 90% of the plastic waste in the world’s oceans is carried there by just 10 rivers – two of which are in India. According to a study by the Helmholtz Centre for Environmental Research, India’s Indus and Ganges rivers carry the second and sixth highest amounts of plastic debris to the ocean. The Indian Ocean, meanwhile, is choked with the second highest amount of plastic out of all of the world’s oceans. Like Kerala’s fisheries minister, Indian politicians appear to be taking action in the face of this mounting crisis. This month India’s prime minister Narendra Modi pledged to eliminate all single-use plastic in the country by 2022, starting with an immediate ban in urban Delhi. The move came just three months after India’s western state of Maharashtra issued a ban virtually all types of plastic bag, disposable cutlery, cups and dishes, as well as plastic containers and packaging. Residents face fines from 5,000 rupees (US$73) for a first time offence to 25,000 rupees ($367) and jail time for repeat offenders, while the state’s Environment Department is also encouraging people to recycle bottles and milk bags through a buy-back scheme. While’s India’s plastic problem is substantial due to the size of its population and its rate of economic growth, schemes such as those in Maharashtra, Delhi and Kerala set an example to western nations. In the US, for example each person on average generates up to 10 times the amount of plastic waste generated by their Indian counterpart. 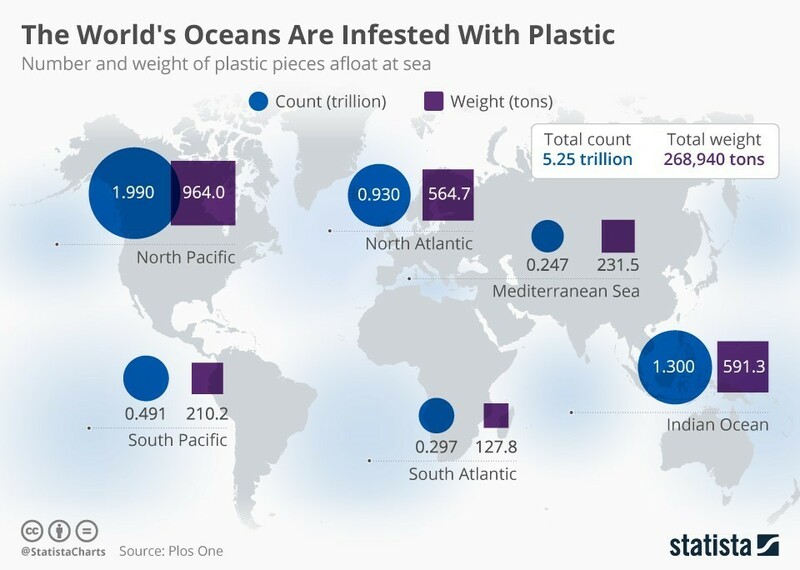 If western nations followed India’s lead of combining political pressure with entrepreneurial ventures, perhaps the world will stand of a chance of avoiding the predicted catastrophe of there being more plastic than fish in the sea by 2050.